But it’s looking like the president’s Europe trip is all about NATO and “reassuring” America’s allies, who aren’t threatened. Now that Ukraine’s presidential election is over, and as preparations are made in Kiev for swearing in the newest billionaire wheeler-dealer to run that country on June 7, President Obama and America’s allies in Western Europe need to eschew triumphalism and get serious about making a deal to stabilize Ukraine. A symbolic chance to kick-start that effort will happen in France later this week, when Obama will have what is likely to be an awkward encounter with autocratic and self-aggrandizing President Vladimir Putin of Russia during ceremonies marking the anniversary of D-Day, 1944. Well, no, we’re not all done. There’s still dangerous fighting going on in parts of eastern Ukraine that border Russia, including a report on Monday of a 500-person assault on a border post by pro-Russian (i.e., mostly Russian) forces. But Russia has signaled that it’s ready to talk turkey with Petro Poroshenko and the new government in Kiev, and Russian troops have moved away from the border, easing tensions. So, you’d think that Obama would use the opportunity presented by a trip to Poland—a country, by the way, with deeply ingrained anti-Russian instincts and close ties to western Ukraine, parts of which used to be “Poland”—to launch a major initiative to ease the crisis. During the trip, Obama will meet Poroshenko. 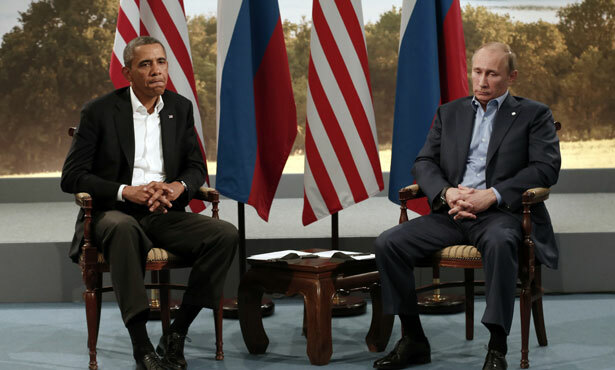 Maybe Obama will announce steps to reignite diplomatic efforts over Ukraine, but it’s not looking good. In a speech in Warsaw on Wednesday, he is set to reaffirm U.S. commitment to defending the region’s security during the 25th anniversary celebrations of Poland’s first free, post-Communist elections, White House officials said. Upon arriving in Poland, the president is set to visit an airport hangar in Warsaw with American and Polish pilots. The visit is intended to underscore the increased joint air training missions in the wake of Russia’s intervention in Ukraine. If it’s only hand-holding the nervous Poles—and, after all, Russia isn’t about to threaten Poland!—then fine. But the emerging Obama Doctrine, if there is one to be discerned, seems focused on building alliances—including military ones—with “partners” overseas. In Europe, that means NATO. In Asia, it means the countries surrounding China. And in the Middle East, it means not just Israel and Saudi Arabia but anti-terrorist units in Lebanon, Turkey, Iraq and Jordan that will be bolstered by the $5 billion anti-terrorism fund Obama has proposed. To be fair to President Obama, he’s hardly been sounding the triumphal trumpet over Ukraine, so far at least, and he’s intelligently resisted calls from hawks—and from the Ukrainian government, including its president-elect!—for arms and military support from the United States. (And from Ted Cruz, that august statesman, who just visited Kiev and said, “One thing I took away from the Ukrainian leaders is that the military lacks basic equipment, such as armor, communication tools and night-vision goggles.”) But what Europe needs most of all, when it comes to American leadership on Ukraine, is not reassurances of America’s commitment to the Atlantic Alliance but some well-crafted strategy for making the Ukraine problem go away. The right argument is one of “strategic patience.” In the long run, just as in the Cold War, the sheer power of the Euro-American economic juggernaut, in comparison to Russia’s extraction-and-export based economy, will eventually pull Ukraine into the West’s orbit. There’s no need to force the issue, or to exacerbate Ukrainian divisions over it. And Russia’s rump Asian economic alliance, with that Kazakhstan powerhouse, hardly constitutes an alternative center of gravity for Ukrainians with a sense of their own self-interest. Plus, the iron, steel and coal industries of the Donets Basin region are, by all accounts, decrepit and inefficient. It isn’t known whether Putin, who’s made it clear that he’s willing to use force and subterfuge to destabilize Ukraine, has figured out that in the long run Ukraine will go its own way. (In an increasingly leveled, multi-polar world, that doesn’t necessarily mean in America’s direction. Europe itself is finding its own identity, as Poland has figured out.) But whatever direction it is, it’s not worth fighting over.